And on this day also died Abba Pawli (Paul) who was the greatest of all the desert monks, and the equal of the angels who keep vigil. This saint was a native of the city of Alexandria, and his name was Pawli (Paul), and he had a brother whose name was Peter, and their father was a rich man. And the multitude of his possessions, of gold, and silver, and costly apparel, was countless. When Abba Pawli (Paul) heard these words he cried out in his heart, saying, “What have I to do with the possessions of this fleeting world, which after a few days I must leave, and depart naked?” Then he turned to his brother, and said unto him, “Let us go back together to our house, for from this time onward I will never speak again about money.” Then he fled from his brother, and went outside the city, and he went into a grave and sat down inside it, and for three days and three nights he prayed and entreated God to guide him into the [right] way. And his brother passed many days in going round about through all the villages seeking for him, but he found him not; and he sorrowed for him with a very great sorrow. And whilst Saint Pawli (Paul) was sitting in that tomb for three days, he did not remember food and drink, and fear and terror did not assail him, for the might of God overshadowed him. And on the fourth day God sent His angel to him, and he caught him up from the grave, and carried him into the Inner Desert, towards the east, and he set him down in that place by the side of a well of water; and then the angel embraced him, and went up into [heaven]. And whilst they were talking together about the greatness of God, behold a raven came at eventide, and dropped down to the saint a whole bread cake. And Abba Pawli (Paul) said unto Abba Anthony, “Now do I know that thou art a man of God. Behold, I have been living in this desert until to-day eighty years, and each day God hath sent unto me half a bread-cake, and behold to-day He hath sent thy food.” And after this they rose up together, and prayed until the star in the west appeared, when they sat down and ate. And after they had eaten they rose up and prayed and glorified God until the dawn broke. And Anthony said unto him, “Blessed be the day, O my father, wherein I was held worthy to see thy face, O blessed Abba Pawli (Paul).” And Saint Abba Pawli (Paul) said unto him, “Rise up now and depart to thy habitation, and bring with thee the garment which Constantine gave unto Athanasius, the Archbishop, and which Abba Athanasius put upon thee, so that thou mayest bury my body therein.” And Anthony marvelled at his words and his mention of the garment of the archbishop, and he believed all the prophecies, which he had prophesied to him. And Saint Abba Pawli (Paul) said unto him, “Make haste, and stand not, for the time of my going forth is nigh, as unto all men.” When Anthony heard this he was greatly frightened, and he wept; and he went out from him, and journeyed for two days and two nights, until he came to his abode. And he took the garment and went back, and as he was on the road he saw Abba Bula (Pawli) (Paul) and the company of the angels singing praises in the air, and they said, “Glory be to God.” And they said also, “Peace be unto thee, O thou chosen one of God, our Lord Jesus Christ, thou blessed father, Abba Pawli (Paul), thou man of God; the angels rejoice with thee, for thou shalt rejoice in the kingdom of the heavens. Darkness hath left thee and they shall take thee to the country of light; sorrow hath left thee, and they shall take thee to the joy, which is forever. Blessed art thou in thy generation, O thou Pawli (Paul), the desert monk, thou man of God, thou Pawli (Paul), the desert monk.” And when they had said these words of praise they disappeared. And the blessed Anthony said, “This is the soul of my father Abba Pawli (Paul) kneeling on his knees with his face [to the ground], and his hands were spread out like a cross. And he took him up and he seemed to be alive, and he covered him over, and wept over him, saying, “Remember me, O my father, in the habitations of heaven wherein thou wilt dwell.” Then Saint Anthony took him, and wrapped his body up in that garment, and he took the Book and fulfilled over him the Canon of the Law of the Church, and he prayed over him three times, and read over him the Four Gospels. And he took up his garment made of the hair of a mule, and he wondered what he should do with it, for he had no digging tool with him. And straightway there came unto him two lions, and they bowed low before the body of Saint Pawli (Paul), and they saluted him. 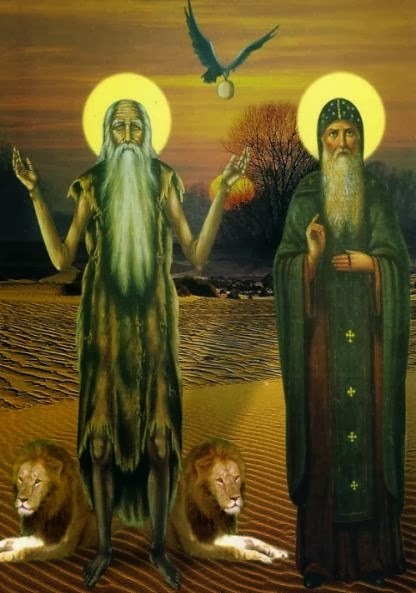 And Abba Anthony was dismayed and was afraid when he saw the lions, and the lions bent their heads to Anthony, as if they were asking him a question, and they licked his feet as if they had known him before, and they made signs to him as if they would say unto him, “Where shall we dig a grave for him?” And Abba Anthony understood their signs, and he measured out for them a space as long as the body of Pawli (Paul), and he showed them how deep the pit was to be, and the two lions dug, one towards the head and the other towards the feet, for a space of four cubits. And Anthony made a sign to them and said unto them, “This is enough for you”; and the lions came up out of the grave, and they crouched before Abba Anthony as if they would say, “Forgive us, and remember us, and bless us.” And he blessed them, and they went away from him, and Saint Anthony wrapped up the body of Saint Abba Pawli (Paul) and buried him. And after this he took the head-cloth, and the pallet, of Abba Pawli (Paul), and his garment made of mule’s hair, like a son who inheriteth the possessions of his father. And he set a mark on the place where his grave was, and he journeyed on foot and departed from the east until he arrived at the city of Alexandria, facing the west. And he went into the presence of Abba Athanasius the Archbishop, and he told him what had happened to Saint Abba Pawli (Paul). And when the archbishop heard the story of the saint he rejoiced and took the garment of the blessed Abba Pawli (Paul), and laid it up by him; and he wore it three times a year, namely on the festival of the Epiphany, on the festival of the Resurrection of the Redeemer, and on the festival of the Great Ascension. And the archbishop sent priests, and deacons, and men, with Abba Anthony, and carts with them to fetch the body of Saint Abba Pawli (Paul). And they went round about in the mountains for many days without finding the grave of the saint, for it was hidden from them [by the sand]. And Saint Abba Pawli (Paul) appeared unto the Archbishop Abba Athanasius, and said unto him, “Send a messenger to bring back the men, and let them not labor [in vain], for God doth not wish any man to see me until the appearance of the Lord Christ”; and the archbishop sent a messenger and brought back the men. And one day God willed to make manifest the glory of the Abba Pawli’s (Paul’s) cloak of mule’s hair. And at that time a certain young man of the city of Alexandria, who was a Christian, died. “Now believe me, O Christian folk, I, your father Atanasius, took this garment of mule’s hair which belonged to the blessed Abba Pawli (Paul), and laid it upon the dead man, and he rose up straightway. I, Athanasius, who have been appointed chief in the Church, saw this with my own eyes. And I, Isidore the bishop, was a witness of this thing. And I, Anthony, who was first appointed a priest by the hand of Abba Athanasius, am a witness of this thing, and I have subscribed this statement.” And two or three other men testified that this was true. And the story of this miracle was noised about throughout all the countries of Egypt, and in the city of Alexandria, and all men marveled, and glorified God, Who worketh miracles by His saints. Salutation to Abba Pawli (Paul).